The folks at SaveKPFA seem to say that anyone who opposes their ideas are union busters. Although it’s a knee-jerk response on their part, it’s a serious charge. Read this for a comprehensive explanation of the union dynamics at KPFA. Historical Analysis: KPFA’s Working Majority Gets Screwed by CWA Job Trust. Brief Summary: Both paid and unpaid staff were represented by United Electrical Workers (UE). Due to machinations, the paid staff formed a union that excluded the unpaid staff. Now, KPFA has staff that are paid to be at the station, and are represented by a union, and are allowed to participate on the Local Station Board. That is too much control in the hands of too few. 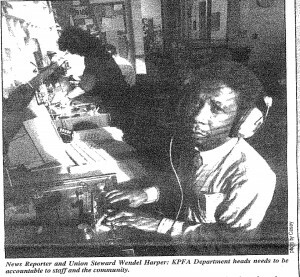 Read recent strong criticism of Save KPFA for union busting at KPFK, our sister station in Los Angeles. Here’s some of the union stalwarts who have endorsed United for Community Radio. Ramses Teon Nichols, Vice President of Organizing, SEIU Local 1021, Local Station Board member from the United For Community Radio slate in 2012. Dave Welsh, San Francisco Labor Council delegate; retired letter carrier, longtime executive vice president of Golden Gate Branch 214 of the Letter Carriers Union; helped protect union jobs from the privatization effort which was the context of the successful struggle to stop the sale of the Berkeley Post Office. A quick list of our endorsers tells the larger story. These people are often active in union issues. They, and the United for Community Radio candidates, know how important vibrant unions are to the crucial progressive issues we work on.